Everest Base Camp Trek 14 days - Package, Price, Itinerary, Route and Fixed Departure Dates. For many, Mount Everest is the synonym to Nepal. Many people come to Nepal to catch a sight of Mount Everest and other peaks in the Khumbu region. The 14 day Everest Base Camp trek is a majestic trip in the evergoing company Dudh Koshi rivers and several snow-covered peaks on the background. Everest Base Camp Trek lies in the lap of the highest peak in the world- Mt. Everest. It is amongst the most popular treks in the world. You get to walk in the footprints set by Sir Edmund Hillary and Tenzing Norgay Sherpa. Along the route, you will get amazing views of different peaks above 8,000 meters in altitude. With proper planning and preparation, you can complete the Everest Base Camp Trek in 14 days. The trek days also include acclimatization days to help adjust your body to the high altitude of the Everest region. This trek takes you to the heart of Sherpa land passing through lush rhododendron forests, boulders, rivers, and icefalls. The highest point you reach in this trek is at Kala Patthar (5545 meters). Kala Patthar is one of the best places in the Everest region to catch splendid views of the Everest. The trails to the Everest Base Camp are clear. As long as you have a moderate fitness level, you can complete the 14 days Everest Base Camp trek. But, one must be careful of the height changes that goes up to the height of around 6,000 meters. So, prepare yourself physically and mentally with proper packaging. Then you can easily walk to the lap of Mount Everest. A direct encounter with the trekkers preparing for mountain expedition at the base camp especially during the expedition season. September- November, and March-May is the best time for this trek. With the moderate climate and pleasant weather, you will have easy walks in the terrains of Everest region. The day time is sunny while night brings chilling weather. It is the pleasantest time of all for trekking in Nepal. Also, this is the time with least possibility of rainfall. So, you will have an easy and enjoyable trek. However, with enough preparation and proper packing you can go on this trek any season of the year including the summer and the winter season. A travel map is a must when you pack your bags and set off for travels, hike, or treks. It is your trustworthy guide when nobody’s around. It helps you to navigate the appropriate route in the mountainside. This is a moderate trek in the rocky terrains of the Everest region of Nepal. In this high altitude trek, the route often goes uphill and then downhill. You do not have to go on vertical climbs. But there are plenty of uphills along the way. It is also a high altitude trek. This means that you might face difficulties in adjusting to the altitude if you don't prepare well. The trek routes in the higher altitudes are often blocked by ice and snow. Chances are high that you may fall on the snow. So, you need to walk slowly and gradually to avoid any mishaps. During summer months (June, July, and August) the minimum temperature at the highest altitude in this trek drops down to 0 degrees. It is among the pleasant time to trek in this region as you do not have to experience extreme cold. While winter months (December, January, and February) are much colder in the mountainous region. The days are sunny with clearer views but night temperature drops down below -20 degrees. For such weather, you need to carry a sleeping bag to beat the mountain cold. Likewise, Autumn season (September- November) is the peak season for this trek. The moderate temperature both during days and night with least rainfall makes this season popular trekking season. Also, Spring season(March-May) is also the best time for this trek as the forests in lower altitudes turn lush with rhododendron blossoms. During this time, the mild temperature eases trekking to the nook and cranny of the region. This is a high altitude trek. You start from the height as low as 1,345 meters in Kathmandu while ascending to the heights above 5,000 meters. As you proceed further the altitude gradually increases. The highest point you reach in this trek is at Kala Patthar- 5,555 meters. The trek route covers treks at high altitude as well as very high altitude. As the altitude increases the problem of shortness of breath occurs so you need to take proper acclimatization before you move on to a new height. Also, to prepare yourself with the changing altitude, you need to involve in different physical exercises and training. While going for EBC trek you will trek to an altitude of 5,600 meters. It means there are several chances you suffer from altitude sickness. Some common signs of altitude sickness include- shortness of breath, nausea, vomiting, dizziness, sleeplessness, blurry vision, and so on. If you notice these symptoms while ascending further, you need to stop trek. Make sure that you drink enough water, take rest for some time, climb downhill. In severe cases, you may take Diamox, only if it is prescribed by your physician. To avoid altitude sickness, you must walk slow and gradual. Acclimatize properly in the changing weather. Most importantly, keep yourself hydrated. The Everest region is a Sherpa people, descendants from the Tibetan Himalayan world. The scattered settlements of Sherpa people all the way from Lukla amazes you in the trek. Also, you can pay a visit to century-old monasteries and Gompas that give you glimpses of the Tibetan Buddhism practiced by Sherpa people. If you visit in the month of October-November, you will get a chance to enjoy Mani Rimdu festival in Tengboche monastery. It is among the biggest celebration in the Khumbu region. In addition, if you take Classic Jiri route, you get chance to encounter different ethnicities- Brahmins, Chhetris, Newar, Tamangs en route to Lukla. Local permit priced US $20 which you can collect at Monjo. Sagarmatha National Park Permit (SNPP) priced US $34 which you can collect at Monjo. If you plan to take Classic Jiri route, you need to collect an additional permit of Gaurishankar Conservation Area Project. It cost the US $20 if you collect it at Nepal Tourism Board, Kathmandu. It costs US $ 40 if you collect it at Shivalaya, Jiri. If you are a solo trekker, you need to collect all the permits by yourself. But if you are traveling with us, we will arrange all the necessary permits for you. Trekking in Nepal is quite cheap in comparison to other popular holiday destinations in the world. In this trek, your cost depends on whether you are traveling with a travel company, or you are traveling alone. The time you wish to visit, the route you take to trek, and the duration you wish to stay on the lap of the Himalayas. It costs US $1120 per person for this trek on two people booking clause. But if you are booking single you are required to pay single supplement price and if you are in a bigger group you may get some discounts s well. In general, you need to pay around the US $20- US $30 for food and accommodation in the tea houses en route. While you need to spare around the US $20- US $30 to the guides and porters too. Travel insurance also adds to your cost in this trek. Travel insurance with a policy that covers evacuation of up to 6,000 meters costs around USD 150. Pre-planning her trek with appropriate gears and packing list is a must. For this trek, the cost of equipment depends on how you get them. You can either buy second hand, or you can rent those gears for a specific time. In addition, if you visit during peak seasons you need to pay for the hot showers, charging devices, and wifi services. Also, you can show some gratitude to your guides and locals for their effort to make your trek a success. Sometimes due to the bad weather, you may face flight cancellation or delays. Or, you may get minor wounds or injuries while walking on the terrains. There could be a situation when you might be in immediate needs of helicopter evacuations, or medical consultancy. For situations like these, travel insurance is a must. After insurance, you can walk free and safe without any fear, or insecurities pulling your back as they cover all your inconvenience. You will find a number of tea houses and fellow trekkers en route to Everest Base Camp. The trails to EBC are well marked. So, you can also go to the Everest Base Camp on your own. But we recommend you to hire a guide( porter-guide, or guide only) for many reasons. They will help you communicate directly with the locals, they will stand by your side in case of some problems, or any emergencies. They also help you pre-book for accommodation and food after tiring walks. Plus, they bargain for the services at tea houses on your behalf. 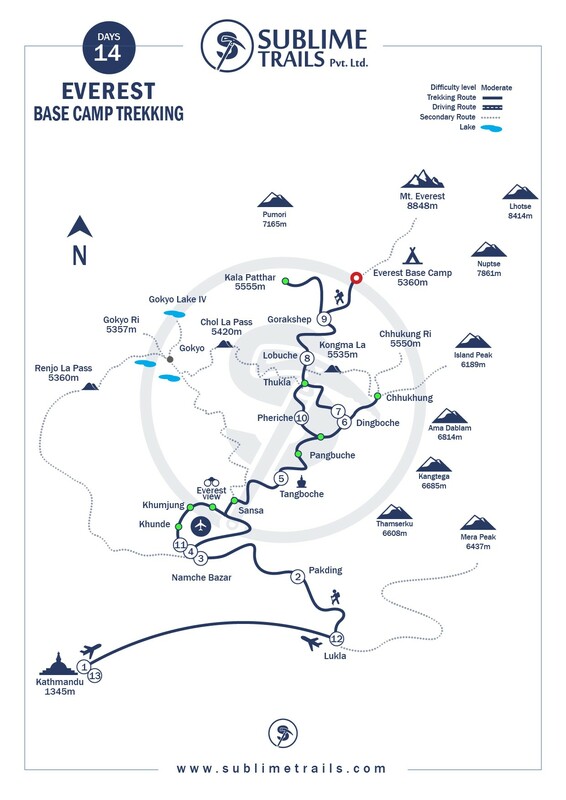 Here is a general 14 days itinerary for the EBC trek via Kathmandu- Lukla route. But, it’s up to you how long you plan to spend your time in the mountainside. You can even plan your own itinerary as per your convenience. 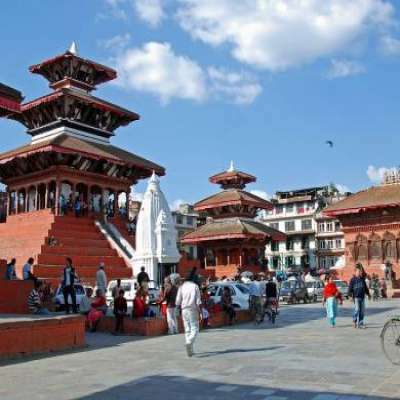 Our representative will pick you up at the airport and transport to the hotel at Thamel in a private vehicle. After some hours rest, you can either go for a short stroll around the city or you can prepare for the trek. If you are a solo trekker, you can prepare for the permits and other related permissions for the trek. Day 02: Flight to Lukla and Trek To Phakding. The next morning you will take a flight of 45 minutes from Kathmandu to Lukla. This thrilling flight takes you to the land of mountains and snow. After checking out at the Lukla Airport you start the first hike of the journey. This short trek from Lukla to the hotels/ tea houses in Phakding is the final destination of the day. After an early breakfast, you start your trek for the day close to the Everest. Walking past the bank of Dudh Koshi river you take many ascends and descends to reach to the gateway to the Everest- Namche Bazaar. En route, you will be enthralled by the lush forests of Rhododendron and Magnolia as you enter Sagarmatha National Park. Namche Bazaar is the famous and the busiest business hub in the highest altitude. This is the last destination for the day. You will find enough hotels (luxurious as well) and tea houses for cozy accommodations. Since EBC trek is a high altitude trek, you need to acclimatize properly in the changing heights. On this rest day at Namche Bazaar, you can either take a short stroll around the beautiful town or you can go on a short hike to Khunde village. If you are lucky, you will get an amazing view of Everest from the town. This is a trekking day to one of the oldest monasteries - Tengboche monastery. After breakfast at Namche, you leave for the monastery to explore its magnificence. If you are lucky, you can meet climbers preparing for their Everest expedition. Because they come to collect blessing before they set off for the expedition. The monastery also offers the best views of mountain peaks in clear weather. The next morning, you start your usual trek to Dingboche. You cross through several villages and streams to get the splendid views of Mount Ama Dablam. The road is sloppy and rocky but, at the end of the day takes you to a serene land. You will find enough tea houses for the rest. But during peak season, we recommend you to pre-book for the food and accommodation. This is a rest day at Dingboche where you will spend enough time exploring the mystic beauty of the place. To adjust in the changing altitude, you go on short hikes around the village, or you can climb Nagarjuna Hill to witness the raw beauty of Lhotse, Nuptse, and the Everest. Or, you can catch the glimpse of Island Peak and the expedition crew from Chukung Ri. The following morning you leave for Lobuche. En route, you will walk through the enticing Khumbu glacier and ice falls. On walking, you will get some time to spend on the memorial where you can pray for the departed trekkers. Also, the majestic views of Lobuche peak are no less alluring after the tiring walks. Different tea houses wait for your arrival with a cozy bed and a warm meal at the end of the day. This is the day you reach to Everest Base Camp- your dream place. After morning breakfast, you walk towards Gorak Shep. Once you reach the tea house at Gorak Shep you take a short rest for some hours. Then, you ascend towards the Base Camp and spend some time there, click pictures. Finally, descend back to Gorak Shep for the night stay. Trek day to the vantage point for the best view of Mount Everest- Kala Patthar. On this day, you leave tea house quite early in the morning to catch the best glimpse of Mount Everest, Lhotse, Nuptse, Ama Dablam, and other peaks. After making memories of the place you descend back to Pheriche for the night stay. You wake up in a room at Pheriche where the snow-covered peak tickles in your bed. After breakfast, you pack your bags and leave for Namche. In the evening, you can enjoy the magnificence of the town in glittering lights. This is the final day on foot. You will walk down the rocky terrains to book for the flight to Kathmandu. If you wish, you can visit the school, the hospital established by Sir Edmund Hillary and donate some cash for their well being. You spend the night there at Lukla and wait for the flight the next morning. The next morning, you catch a flight a flight to Kathmandu. At Kathmandu, you can enjoy the happening Thamel city and chill in the restaurants, spa, and bars open at your service. Note: Sometimes during bad weather, there is a high chance of flight delay or cancellations. You have to prepare mentally for such inconveniences. On this day, you conclude your trek. You either leave for your country, or you can plan further treks in other parts of Nepal. If you choose the Classic Jiri route, the itinerary may extend up to 19 days. This is a pre-designed itinerary for this trek. But, if you are much interested in EBC trek, we can customize it to meet your demands. Pack well. As mountain weather is unpredictable, you need to be very careful while packing. Do not forget to carry a sleeping bag and thermals which you may need any time during nights. Start early. As the afternoon wind is likely to bring cloud and obstruct mountain views. It is better if you leave early for the trek and reach your destination on time. If you do not want to spend out at night with an empty stomach, the better book for food and accommodation early. Especially, if you go on treks during the peak seasons. If you are trekking in monsoon, you must carry insect repellents or table salt to keep away bugs and leeches. Carry your own water bottle and water purifying tablets. Walk slow. Drink enough water. Take enough rest. The trek route and tea houses damaged during the earthquake in completely restored. You will find enough tea houses and lodges for your comfortable stay during the trek. Along the Jiri route, you may see some traces of destruction by the earthquake. But if you choose Lukla flight, you will notice a few damages. Even the tea houses in the higher altitudes are rebuilt. You do not have to fear getting lost, or not finding food and room to sleep. Everest Base Camp trek is for all. If you wish to walk on foot to the base camp, then you can do it. Or, if you do not think you can go on foot, then you do not have to worry at all. You can choose EBC helicopter tour where you will fly directly to the Base Camp and return back to Kathmandu in a day. And, still, catch a glimpse of the world’s highest towering peaks. For detailed information of EBC helicopter tour, click here. You may be interested in our Everest Base Camp Luxury Trekking. If you wish to explore something other than the normal trekkers get, then you can choose alternate routes to reach to the Base CAmp. These routes are peaceful, exotic, and full of life. You will collect extraordinary experiences in these routes. This is an exotic trek route to the base camp. On this route, you cross through less crowded Gokyo valley. Walk past the glistening Gokyo lakes and other glacial lakes. Also, on this route, you climb to Gokyo Ri, to get amazing views of Mount Everest from a different perspective. It is a classic route to the Everest region. On this route, you travel to Jiri on by, or jeep and start walking from the town of Jiri. En route you cross different boulders, rivers, and exotic villages of different ethnic groups. After a few day’s walks, you reach to Lukla and follow the ideal trek route to the base camp. Walking closer to the highest peak in the world is a dream to many. The Everest base Camp quenches your mountain crave on one hand, while on the other it offers you the lifetime memories. Walking past the Sherpa villages, lush forests of pine and rhododendron, and pathways filled in chhortens and prayer flags keeps you contended along the route. You will find nothing to complain about in this overall trek. Are you also thinking of doing this trek? Are you craving for the best Everest views? After making memories on the place you descend back to Pheriche for the night stay. If you choose Classic Jiri route, the itinerary may extend up to 19 days. This is a pre-designed itinerary for this trek. But, if you are much interested in EBC trek, we can customize it to meet your demands. This is Scheduled departure dates but if your date does not match with the given departure date you can let us know, We will surely operate your trip.